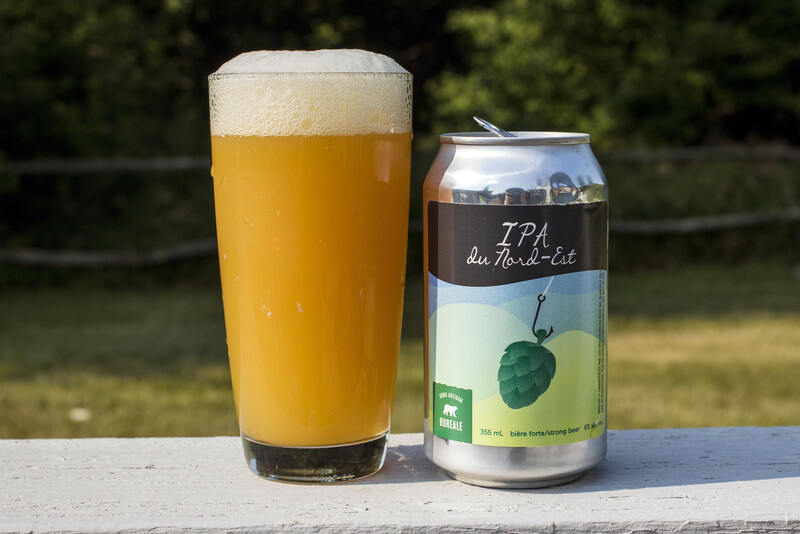 We already know that New England IPAs are the hit of the summer, every brewery is making them! However, who would have thought that the most sought after beer in all of Quebec would be a product by Boréale?! Boréale is one of my go-to breweries while in Quebec, and the brewery holds a lot of nostalgia for me from my days living in Quebec City. It's weird to think that a Boréale product would be insanely well sought after to the point that stores aren't able to keep it in stock the moment it hits the shelves. Well, that's for good reason - the beer is supposedly insanely good! I've had a lot of New England style IPAs in the past six months or so now and I've had a lot of good ones, but also a lot of "this just a kind of sweet IPA". Appearance: First thing here, this is insanely thick and reminiscent of an orange smoothie, it's creamy, it's insanely heavy, a good deal of sediment and looks like a part of a balanced breakfast. It has a murky orange body to it with a light to moderate amount of yellow-beige head on top that is a bit reminiscent of well.. a smoothie. Aroma: Juice! I'm getting notes of orange juice, pineapple juice and even a bit of mango in here. Light amount of bitterness, and a hint of creamsicle at the very end. Taste: Tropical fruit smoothie! This is insanely tasty! This has flavours of oranges, pineapple and mango. It's weird to think that this is an IPA but, well.. it is! It's more reminiscent of a healthy, wholesome smoothie than anything else. It's a bit creamy, so it gives off notes reminiscent of a creamsicle, an ever so slight breadiness to it. Not much of a bitterness from the hops here - more of a hint of grassiness than anything (that's not tropical fruit zest). The aftertaste is a light grainy bitterness with a pineapple sweetness and a bit of a creamy mouthfeel. Overall Thoughts: This is what brewers need to try when they're coming out with their own "NE IPAs". A lot of them are serious misses that look and taste nothing like a juicy New England IPA. This one is full on tropical fruitiness with a heavy dose of creaminess, something I could drink all day long, it's tough to believe that this is 6% ABV! Thick, heavy and juicy! This NE IPA is available in Quebec for now, but it's already sold out at a lot of places. Chère Boréale, keep up the good work!